If you thought Black Friday deals were the be-all and end-all of offers, you thought wrong. Motorola has decided to offer its popular Moto X handset for just $349, SIM-free. This is through Moto Maker for the 16GB storage option and for all carriers, including T-Mobile. If you want the 32GB model you’ll need to pay just $50 more. For the developer editions (both GSM and Verizon) the 32GB model with its bootloader unlocked is also on sale for $399. Currently, Motorola’s Moto Maker is offline due to high traffic. (I’m guessing tons of people found out about the deal). But, it should be back online soon. Keep checking over at https://www.motorola.com/us/motomaker?pid=FLEXR1 or follow @motorola on Twitter for updates. Not unless you are getting it for republic wireless. It isn’t sold by T-Mobile, so most likely not. LOL @ “popular Moto X handset!” They’ve only sold about 500,000 so far–that’s NOTHING, even compared to the LG G2! They’re DESPERATE–that’s probably the ONLY reason they’re doing this. This makes it price competitive with the Nexus 5. Had they priced the Moto X this way from the start, I have a feeling it might have fared better. I thought about buying a Moto X, but now I worry about buying something that may be an obsolete niche with that few units sold. It would have been a great price, prior to the N5 launch, but now it’s Google competing with itself, slightly better battery life vs newer processor and higher resolution screen. It definitely is too sad this wasn’t done at launch, as you stated, even $50-100 more would’ve been great, but too little too late. That 500k was up to the end of September. Taking that sales pace would put them at about 1.3 million units now, assuming no extra activity from opening up to the other big carriers in the states. Yes, it’ll still be relevant in 6-12 months, because it’s getting 4.4. Everything else you stated is personal preference. There’s a posting above with a guy that actually owns both the Nexus 5 and the Moto X and he prefers the Moto X. He even gives the pros and cons of both when compared. I would not get a phone with last year’s specs, regardless of how optimized it supposedly is. Period. exactly…spec is not everything, but it’s darn important when mobile technology evolves at the current breakneck speed. Does anyone besides me feel that cam is really lazy with his post? Yeah, this site is not the same. There was a sale on the Blackberry Z10 for $199 shipped, he missed it. Directly from Blackberry, nothing posted here. It’s LTE for T-Mobile, and it’s factory unlocked too. I just don’t come around like I used to, glad I’m not the only one seeing this. I guess I can’t say he is lazy, but he’s not posting like David used to. Maybe he’s not dedicated like David to run the site. Anyway, I hear you. $199? Dang! Thanks for this info cause I didn’t know this sale was going on. I’m an Android fan but went down to the link on GSM arena’s site with the coupon code BFEMAILZ10 at checkout and saved $200 bucks on a white Z10. Been wanting to check this phone out on T-Mobile’s network as it has wifi calling unbaked in (downloadable app). If anything I’ll sell its not my cup of tea. To be fair, David didn’t post a lot of BlackBerry news after the Z10 came out because there were maybe three of us that cared. I’d post comments about BlackBerry happenings to let people know if anything might interest a T-Mobile customer. Most of us who care frequent CrackBerry for BlackBerry news. I want well-rounded coverage of the different mobile OS platforms, but the interest really isn’t there for BlackBerry information on TmoNews. To be fair, that makes little sense. A story and a good deal, is a story and a good deal. He’s missed things, unlike David in most cases. I agree with the above statement. He need to step it up. Period. David missed quite a few stories. I would read quite a few about T-mobile phones on other sites that would never make it here. I don’t think it’s necessarily laziness. Not every announcement needs a 500 word article. I posted what needed to be posted. Unless you feel there’s anything at all I may have missed, that you don’t already know? I’ll gladly update it with any further information. Eh? there’s like twice the posts lately.. Sounds like troll bait to me. You are correct, this site is not like it was with a previous author. I only visit about once a week now and still catchup on the news since there is not too many. Once again, author does not provide email and no twitter is not an option. I never said you were hiding and if those were the ways to contact you, I did not know about it. And if you must have it, I APOLOGIZE. But there are few stories that you do miss and one thing that I have not heard or want to hear is the thoughts of this Tmonews community regarding the new Lumias that the T-Mobile is supposedly not getting. I have not seen this site report anything about the lumias since the 925. David missed quite a few things in the news too. I would see at least a one article a week that I read on Engadget or Cnet that never made it here. Tis troll bait.. don’t fall for it. You’re doing fine Cam. You’re posting as much (more often in my experience)..
Trolling? How so? Please expand. I have to agree. I’ve been meaning to say this for a few days but haven’t gotten around to it. I’m sure that cam is a great guy and all, but things here have gone downhill fast. There’s no more personal connection with him and this community. This is just a job for him and he posts and/or reposts news that he thinks we would appreciate. We can find that anywhere. We just passed a major holiday here in the US and there was no talk of Thanksgiving like there’s always been in the past. He doesn’t care about the US, he doesn’t care about T-Mobile USA, and he doesn’t care about the community in which he’s supposed to be serving. It is rather sad and disappointing to see that this place has just turned into another generic news site that has just managed to filter out some T-Mobile related news. This is still a great deal for a phone as long as you like the smaller size vs the Nexus 5. Part of me regrets going for the G as a gift rather than taking advantage of this. Too late now, but at least I have $150 in my pocket. The Moto G still isn’t out and you haven’t had it shipped, so you can cancel the order. Is there a version that can be used with AT&T or T-Mobile so it’d work on Straight Talk. Is this better than a Nexus 5? Better camera? You can get the GSM developer edition or the Moto Maker edition for either of those carriers, if the Moto Maker site ever comes back up. I’ve got the nexus 5 now and I plan to switch to the moto x. My wife has the moto x and it’s just an all around better phone. Here’s my thoughts. – wireless charging. Will likely miss this one. – specs. honestly, not an issue if you don’t use intense games and apps. -camera needs lots of software help (likely will be fixed with an update, but still annoying). -speaker is absolutely terrible. might get better with update. unknown. – lots of awesome additions: touchless control, active notifications, bluetooth based screenlock bypass. 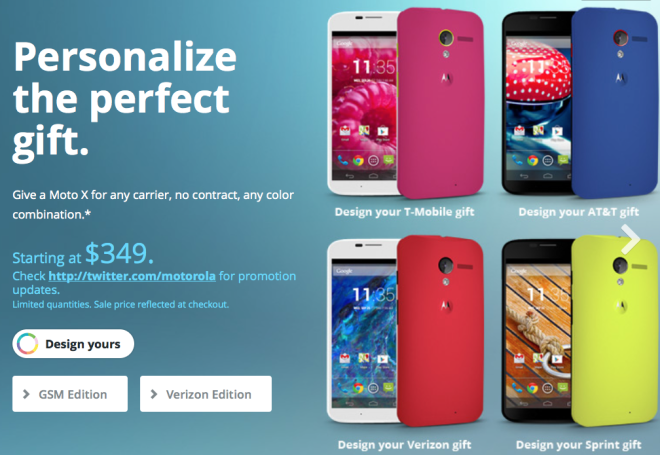 The sale for the Moto Maker version was moved to Wednesday (12/4) at noon EST and Monday, 12/9. The Moto Maker site never came back online today.